Note: There is also a Getting Started video available here. 1. After you've established your account and the collection has been created, you'll need to create a user. Access the Manager Users utility in the Control Panel, supply a user name and enter the password that you'd like to use and then click on the "Add" button. 2. The next step is to add the user that you've created to a global group which is required so that you can add projects. Access the Global Groups tool, click on the "View/Edit Members" link, select the user that you created and then click on the "Save" button. 3. You'll need to configure Visual Studio 2010 to connect to the Team Foundation Server and if you haven't already, follow the steps available in the Visual Studio 2010 Installation and Configuration guide to connect to the server. 3. Access the Team Explorer window and if it's not already visible, access the View menu and then click on Team Explorer. 4. From the Team Explorer window, right-click on the server, then click on the "New Team Project..." option to start the new team project wizard and create your team project. 5. 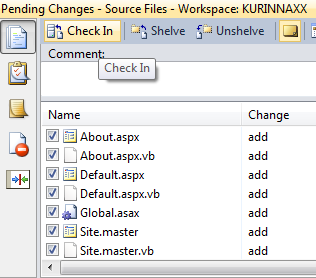 Next, open the local copy of your project/solution/web site and switch to the Solution Explorer. 6. 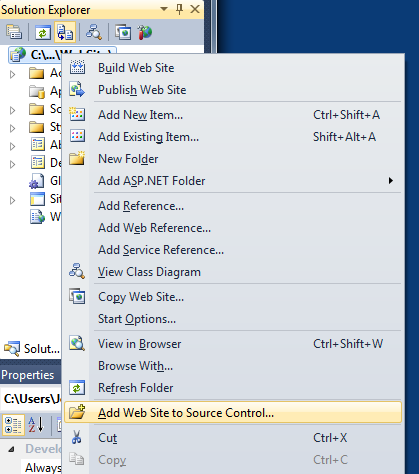 Right-click on your project/solution/web site and click on the "Add Web Site to Source Control..." menu item. 7. In the solution explorer, your files that are now under source control will be denoted by a yellow plus symbol. 8. Since this is a new project, you'll need to check your files in. The easiest method of checking in your files would be to see a complete list that you can bring up by accessing View > Other Windows > Pending Changes. 9. Select all of the folders and files for your project and check them in.